It has been a great honor and privilege to serve as your President of the American Association of Immunologists (AAI). I have enjoyed interacting with the membership, the AAI staff, particularly its Executive Director, Michele Hogan, and my colleagues on the council. I thank you all for your support and inspiration. The past several years have been challenging times for all of us in immunology and in science, in general. However, over my 30-plus years as a scientist it has been quite evident that such challenging times are cyclical, and better times are undoubtedly just around the corner. Indeed, it is encouraging that our new government administration has made science and technology one of the engines on which to build our economic recovery. So, it is important to focus on the positive and why we enjoy and have committed ourselves to scientific discovery in the field of immunology. In this address, I would like to focus on my career in the last quarter of a century, during which time I have had the opportunity to participate in a tidal wave of scientific discovery, mentored a number of extremely talented students and postdoctoral fellows who have trained in my lab, and had the good fortune to collaborate with a large number of talented and inspirational colleagues. For those of you who know my current focus of work, it may be hard to imagine that I trained as a cellular immunologist when I was an MD/PhD student with Frank Fitch at the University of Chicago studying the cellular mechanisms of rat renal allograft enhancement, a form of specific immunologic tolerance. 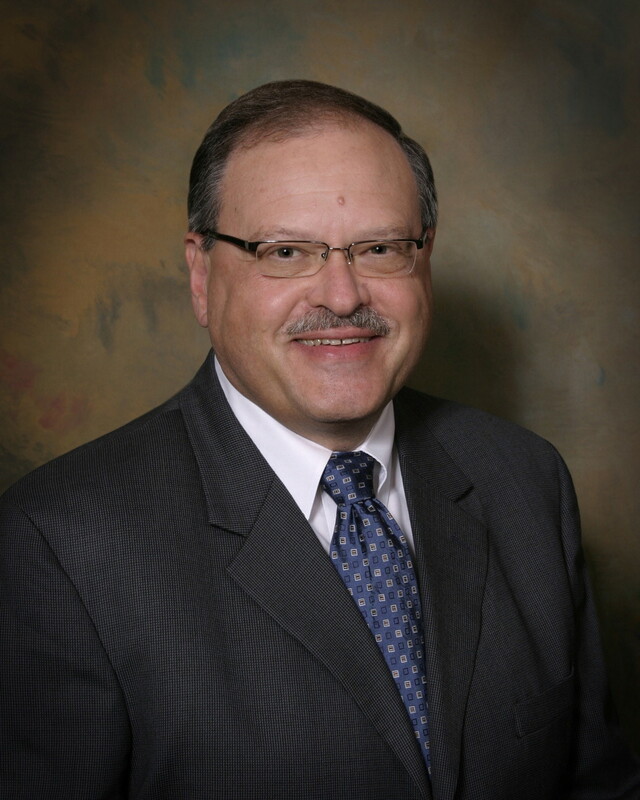 Many of you know Frank because he was a former President of the AAI and the Editor-in-Chief of The Journal of Immunology. In addition to exposing me to the complexity, elegance, and importance of the immune system and its regulation, the most important things Frank taught me were to think critically of the work of others and of my own work as well as to solve problems independently. I cherish those days in Hyde Park at the University of Chicago when I interacted with a very inspiring group of immunology faculty members (Frank Fitch, Don Rowley, Frank Stuart, Bob Hunter, Jose Quintans, and Heinz Kohler) and fellow students (Tom McKearn, Andy Glazebrook, Charlie Lutz, Morris Daley, Terry DuClos, and Tony Meyer). After a short, but stimulating and delightful postdoctoral fellowship in Lausanne, Switzerland with Teddy Brunner and Jean-Charles Cerottini, I did my clinical training in internal medicine at the University of California at San Francisco (UCSF). There, I developed an interest in autoimmune diseases and rheumatologic diseases, in particular for the “fascinomas” (clinical puzzles) they presented. I was drawn to the laboratory of Jack Stobo who was Chief of Rheumatology. Jack inspired me with his enthusiasm for science, scientific insights, and encouragement to think out of the box. But, the “black box” of signaling is exactly what I fell into. In Stobo’s lab, in 1982, I set out with a rather modest goal: to discover the T cell Ag receptor, TCR, by raising mAbs that were clone specific. Identifying the TCR had been a major target for immunologists in the 70s and had been elusive even into the early 80s. But within months of entering the Stobo lab, three groups (Jim Allison’s, Ellis Reinherz’s, and John Kappler and Pippa Marrack’s) accomplished precisely this; they identified Abs that reacted with a clone-specific αβ-chain heterodimer, referred to as Ti (1, 2, 3). A key finding that had come from the work of the Reinherz group was there was an uncharacterized association of CD3 (then called T3) chains with the TCR heterodimer (3). At the time, I had obtained from Kendall Smith the human Jurkat T cell leukemic line that could be stimulated with mitogenic plant lectins (i.e., Con A or PHA) to produce T cell growth factor (which was later named IL-2). I had characterized Jurkat and found that it could express CD3 and be activated to produce IL-2 by anti-CD3 mAbs (mAbs) plus phorbol esters (such as PMA) (4). I realized that Jurkat cells might express a TCR. Moreover, because CD3 chains were expressed on all mature cells and a mAb against CD3 could activate Jurkat cells or T cells much like an Ag, I hypothesized that the CD3 might be the signal-transducing element of the TCR. To test this, I was inspired to do a somatic cell genetic experiment from some ongoing work in the Fitch lab. The goal was to separate the Ti chains from the CD3 chains on Jurkat by selecting for mutants that would be deficient in CD3. I did not yet have a mAb for the Ti chains on Jurkat. After treating Jurkat cells with a chemical mutagen, it was quite easy to select for CD3-deficient mutants. However, once I had them I was not sure whether they still expressed Ti chains on the plasma membrane, because we did not yet have a probe for the Ti protein on Jurkat. However, I decided to ask whether the mitogenic lectins (PHA or Con A) that stimulated T cells or Jurkat cells could still induce the CD3-deficient mutants to produce IL-2. They could not, but I wondered whether mutagenesis altered Jurkat so that it lost the ability to produce IL-2. I decided that we had to bypass the cell surface stimuli and somehow stimulate Jurkat cells via other means to see whether they still retained the ability to produce IL-2. John Imboden, another postdoc in the Stobo lab, told his wife Delores Shoback, an endocrinologist studying calcium regulation via parathyroid hormone, about the our studies. Dolores provided a means toward a key experiment. A calcium-sensitive dye, Quin-2, had just been synthesized by Roger Tsien (6). Dolores suggested that it could be used to measure changes in Jurkat cells following CD3 or PHA (or Con A) stimulation. John and Delores did the experiment in her lab that indeed demonstrated that CD3 or PHA stimulation could induce calcium elevation within seconds in Jurkat cells but not in the CD3-deficient mutants (7). However, only calcium ionophores could induce calcium elevation in the Jurkat mutant cells. These were the first experiments to demonstrate that stimulation of components of the TCR could induce calcium elevations in T lineage cells. I followed this work up by producing a mAb (C305) that reacted with the clone-specific, disulfide-linked heterodimer on Jurkat and found that Jurkat could be activated to produce IL-2 by stimulating it with either anti-CD3 or C305 in the presence of phorbol esters. We showed that stimulation of the Ti component of the TCR could also induce calcium elevations (8). John later showed that this was due to TCR-mediated activation of the inositol phospholipid pathway (9). A few years later, Terri Kadlecek, my technician and long-time collaborator, showed that the TCR activated the inositol phospholipid pathway by inducing the tyrosine phosphorylation of phospholipase Cγ1 (10). These experiments opened the “black box” and introduced me to the field of signal transduction that has subsequently dominated my career. However, there is one other theme that also has long captured my interest and converges on the signaling theme: how the structural complexity of the TCR relates to its function. Others had shown that the CD3 and Ti chains cointernalized from the cell surface. As I mentioned, I had generated a mAb against the Ti αβ-chain heterodimer on Jurkat cells and once again tried to select for Ti αβ or CD3-deficient mutants but was unable to separate these structures from each other, regardless of the selections strategy (11). We subsequently showed, in collaboration with Pam Ohashi, Tak Mak, and Cox Terhorst, that all of these Jurkat mutants, whether selecting for Ti or CD3 deficiency, lacked either the Ti α- or β-chains and contained CD3 chains trapped intracellularly (12). I set up my own lab at UCSF just as Jack Stobo left to become Chair of Medicine at Johns Hopkins. One of my first postdocs, Lee Tan, did what I considered to be a rather elegant experiment. We were interested in how the Ti αβ-chains and CD3 chains are associated. Others had pointed out the unusually positioned acidic and basic residues in the transmembrane of these proteins. We had previously tried to test the importance of these residues via mutagenesis but did not get very far (13). Lee decided to transfer the whole transmembrane domains of Ti αβ to a heterologous protein not associated with CD3. She did this and was able to rescue cell surface CD3 expression of a Jurkat Ti β-chain mutant with CD8/Ti α-chain and CD8/Ti β-chain chimeras (14). Moreover, stimulation of these chimeric receptor complexes with CD8 mAbs activated the cells. This was definitive evidence that the CD3 chains carried the signal-transducing function of the TCR. Lee’s work inspired a new graduate student, Bryan Irving, in my lab to suggest a new experiment to test the function of the CD3 chains and the TCR-associated ζ-chain, which had recently been discovered. It had been thought that the ζ-chain only modified the quality of the TCR signal but did not contain signal-transducing capacity itself (15). Bryan constructed CD8/ζ chimeras, separating these chimeras from the endogenous TCR by eliminating the ζ-chain transmembrane domain. Not only could anti-CD8 mAbs induce signaling in Jurkat T cells, they could do so in Jurkat TCR mutant cells that did not express an endogenous TCR (16). Thus, the ζ-chain was sufficient to confer signaling capability to a heterologous receptor expressed in T cells. Similar work was done simultaneously in Brian Seed’s lab (17). Then, what was the function of the CD3 chains? Work from Bernard Malissen’s lab subsequently showed that not only could the ζ-chain confer such signaling capacity, but so could the cytoplasmic domain of CD3ε (18). The basis for this redundancy was ultimately explained by mutagenesis studies performed in many laboratories that identified a motif common to the CD3 chains, ζ-chain, Ig α- and β-chains, FcRε β- and γ-chains, DAP-12, etc. (Fig. 1⇓). This motif, first noted by Michael Reth, was ultimately dubbed the immunoreceptor tyrosine-based activation motif or ITAM (19). 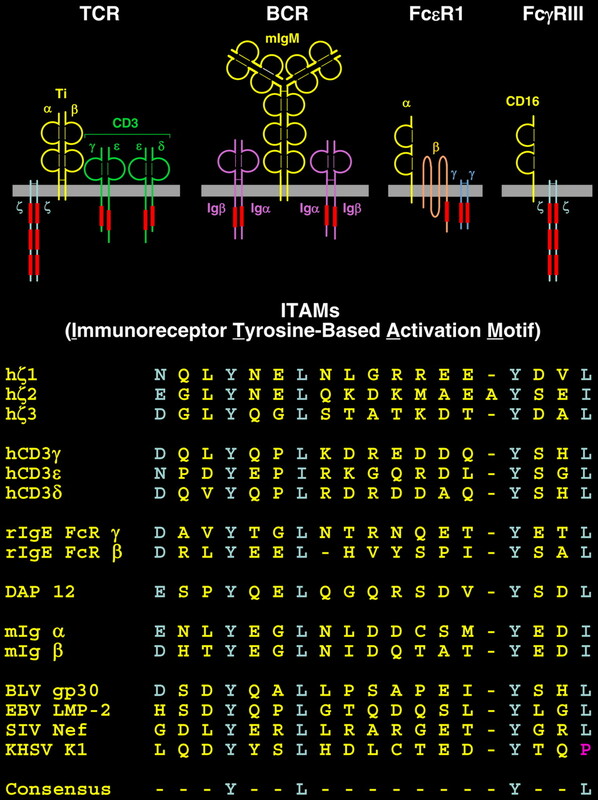 ITAMs of the immunoreceptors and some pathogens known to usurp hematopoietic cell signaling machinery are depicted in red rectangles and their sequences are shown. But how does a simple peptide sequence motif without catalytic function transduce signals? Here, multiple approaches led to the answer. Two approaches in my lab at the time involved somatic cell genetics and protein purification. Mark Goldsmith, my first graduate student, was interested in how the TCR signaled. He was impressed with our approach in developing Jurkat CD3- and Ti-deficient mutants. Mark decided he would use a mutagenesis screen to isolate Jurkat mutants that failed to flux calcium. He used flow cytometry to isolate cells that failed to increase calcium but still expressed a TCR. Mark isolated three mutants, J.CaM1–3, in three complementation groups (20, 21, 22). This approach has yielded many more mutants (Table I⇓) generated by others in my lab and Bob Abraham’s lab as well as in other labs. These mutants have proven invaluable in helping to identify key components in the TCR signaling pathway and demonstrate the power of somatic cell genetics to address such questions. Although Mark did not identify the defects in his three J.CaM mutants, they ultimately provided critical reagents for our understanding of signaling events downstream of the TCR. Work from Carl June and Larry Samelson suggested that tyrosine phosphorylation was initiated downstream of the TCR and that the TCR ζ-chain was inducibly phosphorylated following receptor stimulation (23, 24, 25). This led us to study inducible tyrosine phosphorylation by the TCR in our mutants. Terri Kadlecek first noted defective tyrosine phosphorylation in all three mutants (unpublished data). But, David Straus, a postdoctoral fellow in the lab, discovered that J.CaM1 was deficient in Lck protein expression and had abnormal transcripts (26). The clue was the absence of the constitutive tyrosine-phosphorylated 56-kDa band in Western blots of whole cell lysates made from unstimulated cells. David showed that in J.CaM1 there was no inducible phosphorylation of the TCR ζ-chain or downstream proteins following TCR stimulation and that a tyrosine kinase activity associated in the TCR ζ-chain was lost. All of the lost signaling events were restored by reconstitution with normal Lck. Nicolai van Oers, a postdoc who joined the lab later, showed that Lck is required for TCR ITAM phosphorylation in Jurkat and that Lck plays the predominant role in thymocytes and T cells (27). Thus, David identified Lck as the most proximal tyrosine kinase associated with TCR signaling. At the same time that Brian Irving was working on TCR ζ chimeras and David was working on J.CaM1 and Lck, the work of two other postdoctoral fellows in the lab converged on another protein. Makio Iwashima was trying to identify the TCR-associated tyrosine kinase using transfection approaches. Andy Chan was trying to purify a 70-kDa phosphoprotein that Terri Kadlecek had found in TCR ζ immunoprecipitates from TCR-stimulated Jurkat cells. We named this protein ZAP-70. With the help of Chris Turck, who ran the Howard Hughes Medical Institute protein core facility, Andy was able isolate sufficient CD8/ζ chimera-associated ZAP-70 to get a peptide sequence. Together with Makio, who had superb molecular biological skills, Andy isolated a cDNA clone for ZAP-70 and we discovered that it was a cytoplasmic tyrosine kinase with two SH2 domains. Model for the initiation of the activation of TCR signaling in a CD4 T cell via the sequential actions of Lck and ZAP-70. 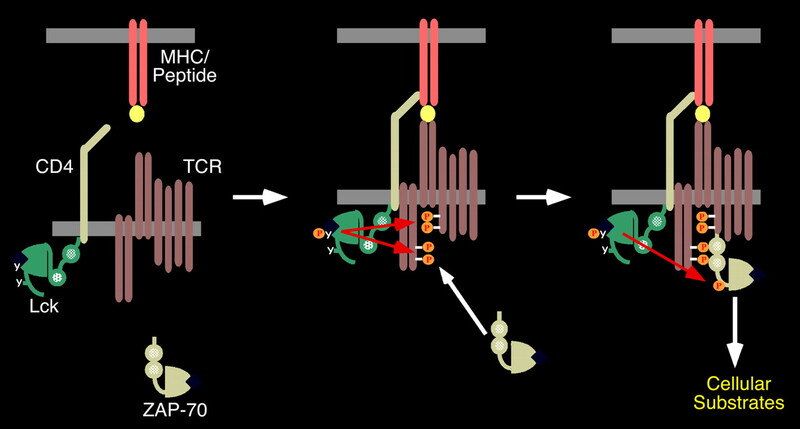 Although we had developed a model for how the TCR initiated signaling, the importance of ZAP-70 was not clear. At this point a lesson from “bedside to the bench” provided convincing evidence for the importance of ZAP-70. Melissa Elder, a pediatric immunology fellow with Tris Parslow, was taking care of a patient with an unusual SCID syndrome characterized by normal numbers of remarkably nonfunctional CD4 T cells in her blood but a paucity of CD8 T cells. The patient had been referred to UCSF for a bone marrow transplant. Strangely, I had in my freezer blood samples sent by Lisa Filopovich from another group of Canadian Mennonite patients with a similar syndrome. Melissa came over to our lab frequently to try to understand the basis for her patient’s apparently signaling-defective CD4 T cells. She had ruled out Lck, and because we had just discovered ZAP-70 she decided to take a long shot with a Western blot. Amazingly, the patient’s T cells failed to express ZAP-70, as did those of the Canadian Mennonite patients whose blood had been in my freezer for years (29, 30). Stimulation of the TCR in these patients failed to increase calcium or downstream tyrosine phosphorylation. Chaim Roifman and his colleagues made a similar discovery in different patients (31). Thus, we had evidence that ZAP-70 function is critical for TCR signaling. We now know from studies performed by many labs that ZAP-70 function is critical for TCR signaling transduction in many contexts. ZAP-70 function is required during thymic development and in peripheral T cells. Mouse models have shown us that the absence of ZAP-70 results in a severe block in thymocyte positive selection (32, 33, 34). Hypomorphic alleles of ZAP-70 have been associated with autoimmunity, at least in mice (35, 36). ZAP-70 may also play a critical role in very early B cell development (37). In the most common form of leukemia in the adult, chronic lymphocytic leukemia (a B cell leukemia), ZAP-70 expression is associated with a poor prognosis (38). Perhaps this is related to the increased BCR signaling in ZAP-70-expressing cells (39). What does ZAP-70 do? It was pretty clear that Lck phosphorylates the TCR ITAMs to initiate signaling and to recruit ZAP-70 to the TCR. Based on the ZAP-70 SCID patients as well as studies of the P116 mutant Jurkat line that Bob Abraham’s lab isolated (40), it was apparent that ZAP-70 is necessary for downstream signaling events. Work from many labs, including those of Larry Samelson and Gary Koretzky (41, 42, 43), led to the identification of two critical ZAP-70 substrates, LAT and SLP-76, which are adaptor molecules that are phosphorylated by ZAP-70. Two of our Jurkat signaling mutants (J.CaM2 and J14.01) proved to be LAT and SLP-76 deficient. Work from the Samelson and Koretzky labs and others, as well as the studies of Tim Finco, Joe Lin, Debbie Yablonski, Greg Ku, and Jen Liou in my lab, has shown that these adaptor molecules help to nucleate and assemble a signaling complex (Fig. 3⇓), which is critical for TCR signaling leading to activation of PLC γ1, Ras, Rac, and HPK1 (44, 45, 46, 47, 48). These downstream events are critical for the many complex functions of T cells. 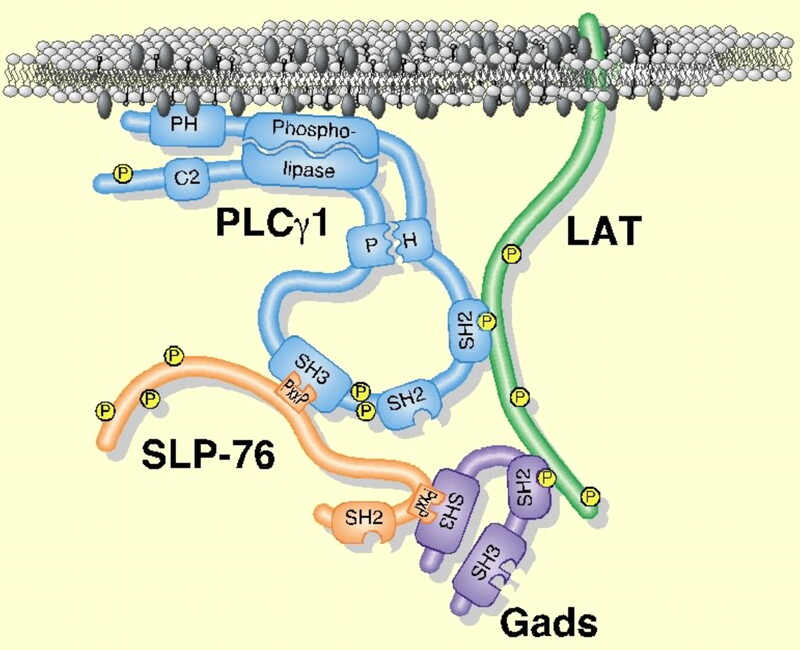 Schematic depiction of the LAT and SLP-76 signalosome that is required for PLC γ1, Ras, Rac, and HPK1 activation. As critical molecules in the TCR signaling pathway have been identified, understanding the regulatory pathways including positive and negative feedback loops has become a focus of our activity. One major focus has been to understand how ZAP-70 is regulated. Recent studies from Tomas Brdicka and Terri Kadlecek followed up on observations of Qihong Zhao focusing on the paradoxical role of two tyrosines, Y315 and Y319, which are phosphorylated by Lck and recruit downstream effector molecules (49). Studies by Tomas and Terri suggested that in the nonphosphorylated state these two tyrosines are involved in the autoinhibition of ZAP-70 (50). Conversely, when phosphorylated, the active state is stabilized. Insights from these studies provided us with a strategy to “trap” ZAP-70 in its inactive conformation, which permitted the crystallization of full-length autoinhibited ZAP-70 in collaborative studies with Sebastian Deindl and John Kuriyan (51). The crystal structure reveals that in the nonphosphorylated state Y315 and Y319 participate in hydrophobic interactions with residues in the inter-SH2 segment and the back of the catalytic domain, including the hinge region (Fig. 4⇓). Moreover, the structure suggests that the binding of a doubly phosphorylated ITAM sequence may induce or stabilize a conformational change that contributes to the activation of the ZAP-70 catalytic function. Current collaborative studies with the Kuriyan lab are aimed at testing this structural model. Schematic depiction of the autoinhibited structure of ZAP-70. Key features of the structure are labeled. Considerable data suggest that ZAP-70 would be an attractive therapeutic target in clinical transplantation and for autoimmune diseases. Yet, after 15 years and considerable effort by the biotech and pharmaceutical industry, no specific inhibitor for ZAP-70 has been developed. Recently, we have used a chemical/genetic system developed by our colleague Kevan Shokat at UCSF (52) to set up a model system for ZAP-70 inhibition. Susan Levin, a former graduate student in the lab, mutated the methionine gatekeeper residue in the catalytic site of ZAP-70 to alanine to enlarge the catalytic site. As a consequence, the mutant ZAP-70 could bind to bulkier ATP-competitive inhibitors that would not be able to inhibit the wild-type ZAP-70 kinase or other kinases expressed in T cells. This allowed Susan to screen a panel of PP1 analogues and identify some that inhibit the “analog-sensitive” mutant of ZAP-70. One such inhibitor, 3-methylbenzyl-PP1, specifically inhibits all TCR functions in Jurkat cells expressing the analog-sensitive mutant but not the wild-type ZAP-70 kinase (53). Thus, this system is specific and is genetically controlled. Recently, Byron Au-Yeung, a postdoc in my lab, has extended the use of this inhibitor to ZAP-70-deficient mice that have been reconstituted with a Bac transgene expressing the ZAP-70 analog-sensitive mutant. This system allows for the inhibition of normal T cells in a chemically/genetically controlled model and offers the promise of not only validating the preclinical therapeutic potential of ZAP-70 inhibition but also of revealing new insights into TCR signal transduction. Studies to date show promising results ex vivo in the specific inhibition of naive and effector T cell functions using T cells expressing the analog-sensitive mutant of ZAP-70 but not wild-type cells. With the importance of tyrosine phosphorylation for TCR signaling, a second major focus for the lab is the study of the reversibility and dynamics of this posttranslational modification by studying not only the kinases but also the protein tyrosine phosphatases. Our lab currently focuses on two receptor-like protein tyrosine phosphatases expressed on hematopoietic lineage cells, CD45 (PTPRC) and CD148 (PTPRJ). CD45 is more important in T cells, and I will focus on those studies here (reviewed in Ref. 54). CD45 is expressed at very high concentrations on T cells, perhaps as high as 25 μM in the two dimensions of the plasma membrane. CD45 transcripts undergo highly regulated alternative splicing, resulting in high m.w. isoforms that are extensively O-glycosylated on naive T cells, but smaller isoforms with reduced O-glycosylation on activated T cells. Deficiencies and mutations that specifically affect the splicing of CD45 result in immunodeficiency and autoimmunity, respectively. Many years ago, Gary Koretzky and Joel Picus, who were then postdoc fellows in my lab, showed that Jurkat T cells require CD45 expression to initiate signaling, including tyrosine phosphorylation (55, 56). This is a consequence of the negative regulatory site of the tyrosine phosphorylation of Src family kinases, including Lck and Fyn in T cells, being a proximal substrate of CD45 catalytic function. 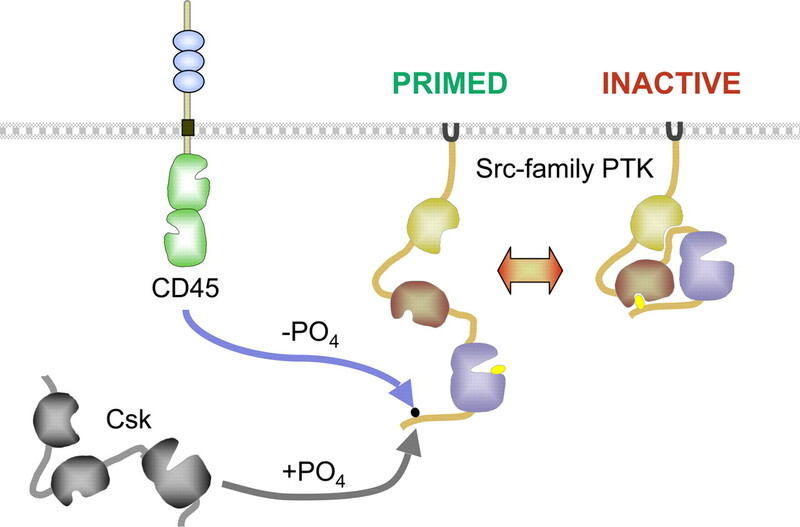 Recent work by previous lab members Ravi Majeti, Michelle Hermiston, and Zheng Xu has focused on the regulation of CD45 by dimerization, which seems to inhibit CD45 function (54, 57, 58, 59). Julie Zikherman, a postdoc fellow in the lab, presented work at this AAI meeting addressing why so much CD45 is expressed on the cell surface. Julie used an allelic series of mice expressing different levels of CD45 and showed that rather low levels of CD45 are sufficient to restore inducible signaling by the TCR, but very high levels are necessary to dephosphorylate the negative regulatory site of Lck and restore basal signaling and development. Moreover, the high levels dampen TCR inducible signaling, which may broaden the sensitivity of the TCR signaling apparatus during thymocyte development. The action of CD45 on the negative regulatory site of Src family kinases is opposed by the cytoplasmic kinase Csk (Fig. 5⇓). Due to the embryonic lethality of mice deficient in Csk, it has been difficult to manipulate or study the dynamic equilibrium of the actions of CD45 and Csk in regulating Lck. Jamie Schoenborn, a postdoc fellow currently in the lab, has tackled this difficult problem by creating an analog sensitive mutant of Csk. Her work with this system, presented at the AAI meeting, shows great promise and reveals a dynamic system of basal signaling regulated by feedback control. Depiction of the opposed actions of CD45 and Csk in regulating Src family function. TCR signaling remains a fascinating topic in the science of the immune system. It has engaged my interest for many years, and there is still so much to understand. I look forward to the work ahead with delight and anticipation. Thank you once again for the opportunity and privilege of serving as your President of the AAI and for allowing me to tell you about our studies that have helped open up the “black box” of signaling in T cells. It has been my good fortune to have two wonderful research mentors, Frank Fitch and Jack Stobo, to whom I am very grateful for their patience, insight, guidance, and friendship. The work in my lab has, in large measure, been conducted by an extraordinarily talented and committed group of students and postdoctoral fellows. Their hard work, insights, and enthusiasm have enriched my professional life enormously. I can’t thank them enough and wish each of them continued success in their careers. Two individuals, Marianne Mollenauer and Terri Kadlecek, have worked with me for more than two decades. They have been wonderful colleagues, collaborators, and friends who have ensured the continuity and success of the lab, in no small measure by making the lab a welcoming place to work. After 24 years as a faculty member at UCSF, I would like to thank my colleagues at UCSF for helping to create a wonderful place in which to work and study immunology. Finally, I thank my wife Shirley for her support and encouragement during the many triumphs and disappointments in my studies of the immune system. The author has advisory relationships with Cellzone, FivePrime Therapeutics, Lycera, Plexxikon, and Portola Pharmaceuticals and recent consulting arrangements with: Pfizer, F. Hoffmann La Roche, Nodality, and Progenics Pharmaceuticals. ↵1 This Presidential Address was presented at the 96th Annual Meeting of the American Association of Immunologists, May 8, 2009, in Seattle, WA. Allison, J. P., B. W. McIntyre, D. Bloch. 1982. Tumor-specific antigen of murine T-lymphoma defined with monoclonal antibody. J. Immunol. 129: 2293-2300. Meuer, S. C., K. A. Fitzgerald, R. E. Hussey, J. C. Hodgdon, S. F. Schlossman, E. L. Reinherz. 1983. Clonotypic structures involved in antigen-specific human T cell function: relationship to the T3 molecular complex. J. Exp. Med. 157: 705-719. Weiss, A., R. L. Wiskocil, J. D. Stobo. 1984. The role of T3 surface molecules in the activation of human T cells: a two-stimulus requirement for IL-2 production reflects events occurring at a pre-translational level. J. Immunol. 133: 123-128. Koretzky, G. A., R. P. Daniele, W. C. Greene, P. C. Nowell. 1983. Evidence for an interleukin-independent pathway for human lymphocyte activation. Proc. Natl. Acad. Sci. USA 80: 3444-3447. Tsien, R. Y., T. Pozzan, T. J. Rink. 1982. Calcium homeostasis in intact lymphocytes: cytoplasmic free calcium monitored with a new, intracellularly trapped fluorescent indicator. J. Cell Biol. 94: 325-334. Weiss, A., J. Imboden, D. Shoback, J. Stobo. 1984. Role of T3 surface molecules in human T-cell activation: T3-dependent activation results in an increase in cytoplasmic free calcium. Proc. Natl. Acad. Sci. USA 81: 4169-4173. Imboden, J. B., A. Weiss, J. D. Stobo. 1985. The antigen receptor on a human T cell line initiates activation by increasing cytoplasmic free calcium. J. Immunol. 134: 663-665. Imboden, J. B., J. D. Stobo. 1985. Transmembrane signalling by the T cell antigen receptor: perturbation of the T3-antigen receptor complex generates inositol phosphates and releases calcium ions from intracellular stores. J. Exp. Med. 161: 446-456. Weiss, A., G. Koretzky, R. C. Schatzman, T. Kadlecek. 1991. Functional activation of the T-cell antigen receptor induces tyrosine phosphorylation of phospholipase C-γ1. Proc. Natl. Acad. Sci. USA 88: 5484-5488. Weiss, A., J. D. Stobo. 1984. Requirement for the coexpression of T3 and the T cell antigen receptor on a malignant human T cell line. J. Exp. Med. 160: 1284-1299. Ohashi, P. S., T. W. Mak, P. Van den Elsen, Y. Yanagi, Y. Yoshikai, A. F. Calman, C. Terhorst, J. D. Stobo, A. Weiss. 1985. Reconstitution of an active surface T3/T-cell antigen receptor by DNA transfer. Nature 316: 606-609. Morley, B. J., K. N. Chin, M. E. Newton, A. Weiss. 1988. The lysine residue in the membrane-spanning domain of the β chain is necessary for cell surface expression of the T cell antigen receptor. J. Exp. Med. 168: 1971-1978. Tan, L., J. Turner, A. Weiss. 1991. Regions of the T cell receptor α and β chains that are responsible for interactions with CD3. J. Exp. Med. 173: 1247-1256. Mercep, M., J. S. Bonifacino, P. Garcia-Morales, L. E. Samelson, R. D. Klausner, J. D. Ashwell. 1988. T cell CD3-ζη heterodimer expression and coupling to phosphoinositide hydrolysis. Science 242: 571-574. Irving, B. A., A. Weiss. 1991. The cytoplasmic domain of the T cell receptor ζ chain is sufficient to couple to receptor-associated signal transduction pathways. Cell 64: 891-901. Romeo, C., B. Seed. 1991. Cellular immunity to HIV activated by CD4 fused to T cell or Fc receptor polypeptides. Cell 64: 1037-1046. Wegener, A. M., F. Letourneur, A. Hoeveler, T. Brocker, F. Luton, B. Malissen. 1992. The T cell receptor/CD3 complex is composed of at least two autonomous transduction modules. Cell 68: 83-95. Goldsmith, M. A., P. F. Dazin, A. Weiss. 1988. At least two non-antigen-binding molecules are required for signal transduction by the T-cell antigen receptor. Proc. Natl. Acad. Sci. USA 85: 8613-8617. Goldsmith, M. A., D. M. Desai, T. Schultz, A. Weiss. 1989. Function of a heterologous muscarinic receptor in T cell antigen receptor signal transduction mutants. J. Biol. Chem. 264: 17190-17197. Goldsmith, M. A., A. Weiss. 1987. Isolation and characterization of a T-lymphocyte somatic mutant with altered signal transduction by the antigen receptor. Proc. Natl. Acad. Sci. USA 84: 6879-6883. June, C. H., M. C. Fletcher, J. A. Ledbetter, L. E. Samelson. 1990. Increases in tyrosine phosphorylation are detectable before phospholipase C activation after T cell receptor stimulation. J. Immunol. 144: 1591-1599. June, C. H., M. C. Fletcher, J. A. Ledbetter, G. L. Schieven, J. N. Siegel, A. F. Phillips, L. E. Samelson. 1990. Inhibition of tyrosine phosphorylation prevents T-cell receptor-mediated signal transduction. Proc. Natl. Acad. Sci. USA 87: 7722-7726. Weissman, A. M., P. Ross, E. T. Luong, P. Garcia-Morales, M. L. Jelachich, W. E. Biddison, R. D. Klausner, L. E. Samelson. 1988. Tyrosine phosphorylation of the human T cell antigen receptor ζ-chain: activation via CD3 but not CD2. J. Immunol. 141: 3532-3536. Straus, D. B., A. Weiss. 1992. Genetic evidence for the involvement of the lck tyrosine kinase in signal transduction through the T cell antigen receptor. Cell 70: 585-593.
van Oers, N. S., N. Killeen, A. Weiss. 1996. Lck regulates the tyrosine phosphorylation of the T cell receptor subunits and ZAP-70 in murine thymocytes. J. Exp. Med. 183: 1053-1062. Weiss, A.. 1993. T cell antigen receptor signal transduction: a tale of tails and cytoplasmic protein-tyrosine kinases. Cell 73: 209-212. Chan, A. C., T. A. Kadlecek, M. E. Elder, A. H. Filipovich, W. L. Kuo, M. Iwashima, T. G. Parslow, A. Weiss. 1994. ZAP-70 deficiency in an autosomal recessive form of severe combined immunodeficiency. Science 264: 1599-1601. Elder, M. E., D. Lin, J. Clever, A. C. Chan, T. J. Hope, A. Weiss, T. G. Parslow. 1994. Human severe combined immunodeficiency due to a defect in ZAP-70, a T cell tyrosine kinase. Science 264: 1596-1599. Arpaia, E., M. Shahar, H. Dadi, A. Cohen, C. M. Roifman. 1994. Defective T cell receptor signaling and CD8+ thymic selection in humans lacking ZAP-70 kinase. Cell 76: 947-958. Elder, M. E., S. Skoda-Smith, T. A. Kadlecek, F. Wang, J. Wu, A. Weiss. 2001. Distinct T cell developmental consequences in humans and mice expressing identical mutations in the DLAARN motif of ZAP-70. J. Immunol. 166: 656-661. Kadlecek, T. A., N. S. van Oers, L. Lefrancois, S. Olson, D. Finlay, D. H. Chu, K. Connolly, N. Killeen, A. Weiss. 1998. Differential requirements for ZAP-70 in TCR signaling and T cell development. J. Immunol. 161: 4688-4694. Sakaguchi, N., T. Takahashi, H. Hata, T. Nomura, T. Tagami, S. Yamazaki, T. Sakihama, T. Matsutani, I. Negishi, S. Nakatsuru, S. Sakaguchi. 2003. Altered thymic T-cell selection due to a mutation of the ZAP-70 gene causes autoimmune arthritis in mice. Nature 426: 454-460. Siggs, O. M., L. A. Miosge, A. L. Yates, E. M. Kucharska, D. Sheahan, T. Brdicka, A. Weiss, A. Liston, C. C. Goodnow. 2007. Opposing functions of the T cell receptor kinase ZAP-70 in immunity and tolerance differentially titrate in response to nucleotide substitutions. Immunity 27: 912-926. Schweighoffer, E., L. Vanes, A. Mathiot, T. Nakamura, V. L. Tybulewicz. 2003. Unexpected requirement for ZAP-70 in pre-B cell development and allelic exclusion. Immunity 18: 523-533. Rassenti, L. Z., L. Huynh, T. L. Toy, L. Chen, M. J. Keating, J. G. Gribben, D. S. Neuberg, I. W. Flinn, K. R. Rai, J. C. Byrd, et al 2004. ZAP-70 compared with immunoglobulin heavy-chain gene mutation status as a predictor of disease progression in chronic lymphocytic leukemia. N. Engl. J. Med. 351: 893-901. Chen, L., J. Apgar, L. Huynh, F. Dicker, T. Giago-McGahan, L. Rassenti, A. Weiss, T. J. Kipps. 2005. ZAP-70 directly enhances IgM signaling in chronic lymphocytic leukemia. Blood 105: 2036-2041. Williams, B. L., K. L. Schreiber, W. Zhang, R. L. Wange, L. E. Samelson, P. J. Leibson, R. T. Abraham. 1998. Genetic evidence for differential coupling of Syk family kinases to the T-cell receptor: reconstitution studies in a ZAP-70-deficient Jurkat T-cell line. Mol. Cell Biol. 18: 1388-1399. Zhang, W., J. Sloan-Lancaster, J. Kitchen, R. P. Trible, L. E. Samelson. 1998. LAT: the ZAP-70 tyrosine kinase substrate that links T cell receptor to cellular activation. Cell 92: 83-92. Fang, N., D. G. Motto, S. E. Ross, G. A. Koretzky. 1996. Tyrosines 113, 128, and 145 of SLP-76 are required for optimal augmentation of NFAT promoter activity. J. Immunol. 157: 3769-3773. Motto, D. G., S. E. Ross, J. Wu, L. R. Hendricks-Taylor, G. A. Koretzky. 1996. Implication of the GRB2-associated phosphoprotein SLP-76 in T cell receptor-mediated interleukin 2 production. J. Exp. Med. 183: 1937-1943. Finco, T. S., T. Kadlecek, W. Zhang, L. E. Samelson, A. Weiss. 1998. LAT is required for TCR-mediated activation of PLCγ1 and the Ras pathway. Immunity 9: 617-626. Ku, G. M., D. Yablonski, E. Manser, L. Lim, A. Weiss. 2001. A PAK1-PIX-PKL complex is activated by the T-cell receptor independent of Nck, Slp-76 and LAT. The EMBO J. 20: 457-465. Lin, J., A. Weiss. 2001. Identification of the minimal tyrosine residues required for linker for activation of T cell function. J. Biol. Chem. 276: 29588-29595. Liou, J., F. Kiefer, A. Dang, A. Hashimoto, M. H. Cobb, T. Kurosaki, A. Weiss. 2000. HPK1 is activated by lymphocyte antigen receptors and negatively regulates AP-1. Immunity 12: 399-408. Yablonski, D., M. R. Kuhne, T. Kadlecek, A. Weiss. 1998. Uncoupling of nonreceptor tyrosine kinases from PLC-γ1 in an SLP-76-deficient T cell. Science 281: 413-416. Zhao, Q., B. L. Williams, R. T. Abraham, A. Weiss. 1999. Interdomain B in ZAP-70 regulates but is not required for ZAP-70 signaling function in lymphocytes. Mol. Cell Biol. 19: 948-956. Brdicka, T., T. A. Kadlecek, J. P. Roose, A. W. Pastuszak, A. Weiss. 2005. Intramolecular regulatory switch in ZAP-70: analogy with receptor tyrosine kinases. Mol. Cell Biol. 25: 4924-4933. Deindl, S., T. A. Kadlecek, T. Brdicka, X. Cao, A. Weiss, J. Kuriyan. 2007. Structural basis for the inhibition of tyrosine kinase activity of ZAP-70. Cell 129: 735-746. Shah, K., Y. Liu, C. Deirmengian, K. M. Shokat. 1997. Engineering unnatural nucleotide specificity for Rous sarcoma virus tyrosine kinase to uniquely label its direct substrates. Proc. Natl. Acad. Sci. USA 94: 3565-3570. Levin, S. E., C. Zhang, T. A. Kadlecek, K. M. Shokat, A. Weiss. 2008. Inhibition of ZAP-70 kinase activity via an analog-sensitive allele blocks T cell receptor and CD28 superagonist signaling. J. Biol. Chem. 283: 15419-15430. Hermiston, M. L., Z. Xu, A. Weiss. 2003. CD45: a critical regulator of signaling thresholds in immune cells. Annu. Rev. Immunol. 21: 107-137. Koretzky, G. A., J. Picus, T. Schultz, A. Weiss. 1991. Tyrosine phosphatase CD45 is required for T-cell antigen receptor and CD2-mediated activation of a protein tyrosine kinase and interleukin 2 production. Proc. Natl. Acad. Sci. USA 88: 2037-2041. Koretzky, G. A., J. Picus, M. L. Thomas, A. Weiss. 1990. Tyrosine phosphatase CD45 is essential for coupling T-cell antigen receptor to the phosphatidyl inositol pathway. Nature 346: 66-68. Majeti, R., Z. Xu, T. G. Parslow, J. L. Olson, D. I. Daikh, N. Killeen, A. Weiss. 2000. An inactivating point mutation in the inhibitory wedge of CD45 causes lymphoproliferation and autoimmunity. Cell 103: 1059-1070. Xu, Z., A. Weiss. 2002. Negative regulation of CD45 by differential homodimerization of the alternatively spliced isoforms. Nat. Immunol. 3: 764-771. Hermiston, M. L., J. Zikherman, A. L. Tan, V. C. Lam, N. M. Cresalia, N. Oksenberg, N. Goren, D. Brassat, J. R. Oksenberg, A. Weiss. 2009. Differential impact of the CD45 juxtamembrane wedge on central and peripheral T cell receptor responses. Proc. Natl. Acad. Sci. USA 106: 546-551. Cao, Y., E. M. Janssen, A. W. Duncan, A. Altman, D. D. Billadeau, R. T. Abraham. 2002. Pleiotropic defects in TCR signaling in a Vav-1-null Jurkat T-cell line. EMBO J. 21: 4809-4819. Roose, J. P., M. Mollenauer, V. A. Gupta, J. Stone, A. Weiss. 2005. A diacylglycerol-protein kinase C-RasGRP1 pathway directs Ras activation upon antigen receptor stimulation of T cells. Mol. Cell Biol. 25: 4426-4441.